If St. Pete has to put another $5, $10 or even $20 million into the project to get something workable, it is time to step up to the plate. Reality has set in and what was carefully manipulated through the "public process" cannot be built for the amount available. I don't know about you, but I am not surprised. I had a bit of the same sensation this weekend as my wife and I, who are looking for a new home, found this really lovely one for about $400,000, which seems a bit out of reach. Romano comes up with the perfect solution: increase the budget. Romano takes exception to the bait and switch argument see my post Bait and Switch? Entice and transfer? Deflect and deceive? The New New Pier design is here. I doubt if John knows what a bait and switch really is, but I did 10 years with Sears Roebuck 5 in management in the 80s and believe me, I know bait and switch when I see it. The real issue is when Kriseman, and his crack dream team decided to turn Mike Connors lose to derail the public process, so they could tear down a $20 to $30 million asset they had no clue that they were being hoodwinked by the designers they were pushing. Or did they? Sort of brings up the question did this design team know in advance they were a shoo in? Maybe Mike Deeson can take a look at that one. Since I am waxing metaphorical, the horse is out of the barn, the die is cast, the chickens have come home to roost, or add your own the St. Pete Pier has become the expected mess. All you folks in the arts community had better start tightening your belts and before those of you working on South, St. Pete programs funded by the City start spending, I would make sure you have the promised money in the bank. The thing I really like about the City pitching in extra millions of dollars to build something most people do not want is that it makes a great Kriseman scoreboard. 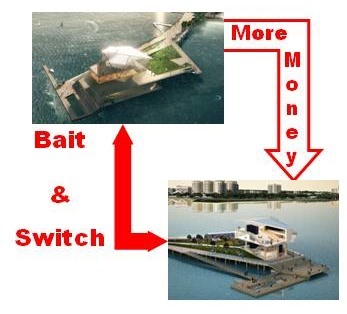 Every dollar Kriseman has to squeeze out of somewhere to build the Pier is another reason not to vote for his reelection.